I mentioned earlier that IO scheduler CFQ coming by default in RedHat / CentOS 5.x may be not so good for MySQL. And yesterday one customer reported that just changing cfq to noop solved their InnoDB IO problems. 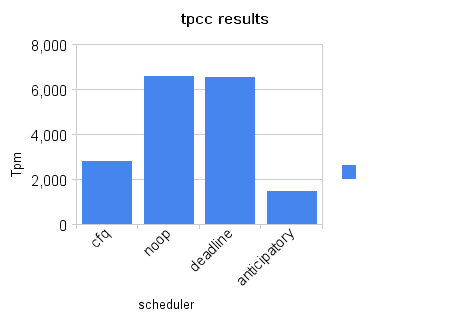 I ran tpcc scripts against XtraDB on our Dell PowerEdge R900 server (16 cores, 8 disks in RAID10, controller Perc/6i with BBU) to compare cfq, deadline, noop and anticipatory (last one just to get number, I did not expect a lot from anticipatory). As you see noop / deadline can utilize disks much better. CentOS 5.2 is using Kernel 2.6.18, right? I suspect results would be different (maybe still in favour of noop, but probably not that much) without a BBU unit (and therefore without O_DIRECT), or with controler configured for write-through, or with a cheaper controler, and perhaps with a more write costly RAID discipline (ie. RAID 5). A setup with storage accessible through multiple LUNs and/or multiple controlers may also be a good use case for cfq. On the other hand, results may be even more favouring noop if you used SSD drives. I mean, chances are that those results are somehow hardware dependants (though I think the one you used for this test has the merit to be a quite typical setup). How much RAM do you have on this PERC6 (I think Dell as options for 256 MB and 512 MB, at least)? This is interesting stuff. Can anybody speculate on the variables at work here? Would I expect to get similar results on RAID vs single drives vs SAN vs NFS, etc? Looks like noop is the best scheduler for an INNODB server? Or is this a case of run it yourself and test because your mileage may vary? Of course if change controller, remove BBU, set write-trough you may have different result. But I took configuration most optimal for MySQL and one we recommend to customers. Perc6i comes with 256MB RAM. I would say it is better for InnoDB server to use ‘noop’ or ‘deadline’ scheduler. ‘Deadline’ was even used by default in kernels < 2.6.18, and changing default to cfq in server configuration in not the best idea. For other workloads we have to run another tests. Did you measure queue depth and request latency by chance ? In my experience results for schedulers are often rather platform and workload specific. For this hardware and benchmark we have such results. In other conditions I’ve seen other schedulers being better. Results are not surprising smart RAID with cache and multiple devices is smart enough by itself to optimize IO, it also has much more info about storage so can do it much more efficiently. It is surprising the gap between deadline and noop is so small. An interesting note about O_DIRECT though… and so how it can affect results. In this kernel (at least) O_DIRECT serialized writes on inode level which can affect things significantly. I also did not quite get the point as without BBU and so without O_DIRECT – even if you do not have BBU O_DIRECT is often very helpful allowing to avoid double buffering. It may be slower though in case workload is write bound because IO serialization for O_DIRECT. And there’s no difference between noop and deadline is simply because deadline is noop with starve protection. If you do not starve too much, there’s not much need for deadline. that performances wouldn’t improve much after a certain size is reached). does this differs from ext3’s data=writeback side effects? You are also very on point when you bring up latency in the discussion (and also queues size/depths); indeed scheduling is not only about aggregating write requests and bulk performances, but also about arbitrating resources usage among consumers and making decisions about avg vs. worst case latencies vs. throughput, which sometimes does matters. I suspect a mixed workload (alternated write intensives, reads, and cpu bound moments, not just huge sustained writes) would give controller better chances to reorder properly before cache being filled up. If so, scheduler added complexity may be even more a waste, but in those conditions, user’s perceived performances may be more reflected by per-request time to completion (so, latency). I mean workloads including possibles concurrents reads and cpu work, idling moments, etc. as opposed to steady, bulk, write-only workloads (ie. importing dumps), where one may rather account the total, wall clock time needed to write the whole dataset without interruptions. Having a nicely interactive ajax interface stuck because some bulk thing does fill the BBU cache, the I/O queue and the innodb log file in the background may not be the expected behaviour, even if it gives a lower cumulated time to complete (therefore more TPS). On this matter: thanks to the recent work on cgroups and containers resources control, Linux got a lot of refining in order to expose and enforce I/O priorities and arbitration. I’m not sure whether MySQL do leverage those features though (maybe it would be useful to lower priority for logs->data moves, or to increase priorities when big locks are held, or when deadlocks starts to happen?) neither how well do the different I/O elevators handles those features. And to the best of my knowledge, SQL does lack a way to specify expected QoS per request (I mean, something like TCP/IP TOS field) which would allow exposing this to consumers (although MySQL offers INSERT DELAYED). Back to the subject, I don’t know anything about tpcc (and even less about how it’s used here): does this bench really spreads writes to emulate some randomness (wrt block device layout) or is it more of a “plain sequential bulk insert/update on a very few tables” thing? Seekwatcher (http://oss.oracle.com/~mason/seekwatcher/) graphs would be interesting for such benchmarks, if anything to show what patterns you actually do measure (that’s to insidiously revive the “Tools” post ;). Did Linux get per request priorities finally ? I worked with an University some time ago to see how IO priorities can be useful and they were quite helpful allowing to work with large queue sizes without starving log writes etc. Now about disk IO scheduling and cache. Really it is a bit different though connected. The dirty pages to be flushed are picked by the kernel (background flush or forced by fsync) and when submitted to the kernel together with reads request. If you have a lot of dirty pages there is indeed a better chance to optimize IO. yes, that’s why I got mistaken: by thinking O_DIRECT would prevent to-be-written data to go from userland through kernel page cache before being sent to the controler, writes wouldn’t be well scheduled (and believing in consequence that it would be a huge loss on bbu-less systems). So I was triply dumb because the alternative to O_DIRECT is fsync()ing the data file after write, which doesn’t leave much room for merging requests either, and because this (O_DIRECT) only apply for data moved from logs to data file (MySQL can probably order this well already), and also because schedulers (at least cfq) are also able to arbitrate which requests (not only “which pages”), even direct ones, can go to some device at any moment (so even then scheduler shouldn’t be totaly bypassed if I’m not mistaking again). And sadly no, theres no per request priorities yet as far as I know (not even per posix thread yet, but just per process, which indeed is way more pratical to use for PostgreSQL than it is for MySQL right now, but that may deserve a small little smallish tiny fork, maybe ;). Same goes for ioprio_set(2). I used Deadline with MySQL for many years… Recently I wanted to test the CFQ Idle class for an IO-intensive job running everyday and causing a slight lag in replication. The end-result was even worse, causing more lag in MySQL by running the job faster. With <2.6.24 kernels I even experienced a bug in which both MySQL and the job were running ridiculously slow with barely no IO operations on the RAID. (read the last part of the article). Stumbled on this thread. I’m benchmarking fs/schedulers on a small HW RAID-5 set of 4x400GB SATA. It’s a lab-setup used for parallel sequential streams and not DB usage. Raid adapter is PERC6/E, 1MB raid element size, Cached, Adaptive Read-ahead. Kernel 2.6.31.5 (Arch Linux). – cfq vs noop makes a *lot* of difference. In this setup cfq seems close to broken. deadline is similar to noop. Thank you for sharing results. They are in line with my experience. With RAID controller, ‘cfq’ is not suitable to use.